BRACE Integrated Services Southeast Division is proud to announce it has received 2 Safety Awards for its continuous commitment to Safety. 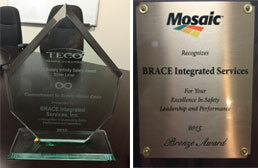 BRACE Integrated Services Southeast division is recognized by The MOSAIC Company (the world’s leading integrated producer and marketer of concentrated phosphate and potash) for Excellence in Safety Leadership and Performance. BRACE Integrated Services Southeast Division is recognized by TECO (Tampa Electric) for its Outstanding Safety Performance and Leadership.